A Yale undergrad may force us to rewrite geology and biology books, after reporting a find which suggests that life can exist much deeper than currently believed, at temperatures at which DNA is barely stable. Photo credit: Philippa Stoddard. A hundred million years ago this outcrop is thought to have been 20km down, yet it still contains evidence of life. 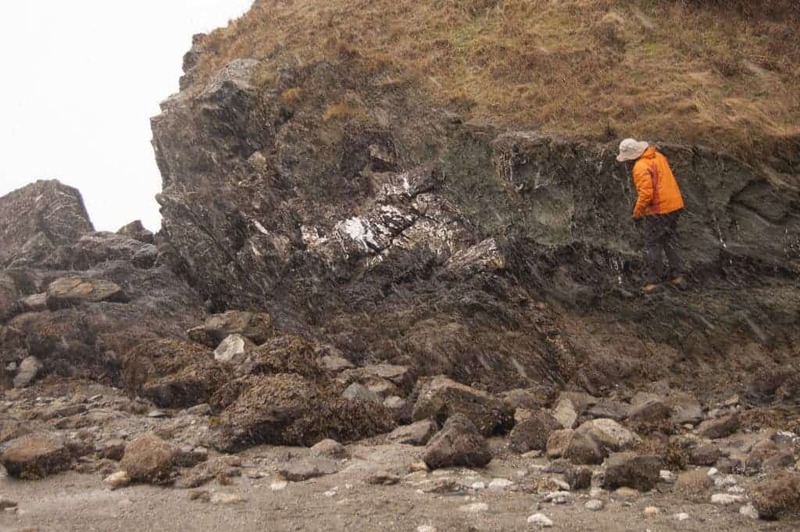 Geologists found carbon isotopes in rocks on Washington state’s South Lopez Island; these isotopes suggest the minerals grew from fluids flush with microbial methane. Microbial methane has a very distinct chemical signature and can be discerned with relative ease from non-organic methane. At the time microbes lived in this environment, the rocks were buried 20 km deep. At the Geological Society of America’s annual meeting, Yale undergraduate student Philippa Stoddard reported on the discovery of aragonite in the San Juan Islands, Washington State. Aragonite is a carbonate mineral, one of the two common, naturally occurring, crystal forms of calcium carbonate, CaCO3 (the other form being the mineral calcite). There are pale veins of aragonite cutting through basalt rocks that sat offshore North America millions of years ago. Stoddard found an outcrop where aragonite veins have anomalously light concentrations of carbon isotopes, with up to 50 fewer heavy isotopes per million atoms. This is the key signature which suggests that the methane was released by microorganisms. “We propose that the aragonite veins were formed by oxidation of methane. The degree of oxidation was variable, as indicated by the wide range of carbon isotope values. If correct, then the lightest carbon values would represent the isotopic composition of the methane. At low surface pressures, bacterial life is know to remain active to temperatures of ~122 C. Biomolecules are stabilized by pressure, so bacterial life should extend to higher temperatures within the Earth’s interior. We suggest that the Lopez Island aragonite veins are evidence of this deep life”, the study writes. The fact that microorganisms could survive at those depths is truly remarkable. If we consider that the average geothermal gradient is about 25 degrees Celsius per 1 km (1 °F per 70 feet of depth), then at 20 km you get almost 500 degrees! Arguably, you could say that the geothermal gradient was a bit more mellow in that area (though that’s still not clear yet), but we’re still dealing in the hundreds of degrees Celsius here – at those temperatures, DNA itself is barely stable. Stoddard and her collaborators plan to sample more aragonite samples from the area to see if this was an anomalous concentration (or perhaps a measuring error), or if the same thing can be found throughout more outcrops. Geologists also have to better understand the thermal environment which may have allowed microbes to survive at that depth. “We reason that you could have life deeper in subduction zones, because you have a lot of water embedded in those rocks, and the rocks stay cold longer as the [plate] comes down,” Stoddard said. That’s definitely a possibility, but still not a proven fact.